Yesterday, we were rummaging through our kitchen to find out what we have which we could cook for lunch. In most Chinese homes, dried chinese mushrooms and dried prawns / shrimps are commonly found. So are bee hoon (rice vermicelli). 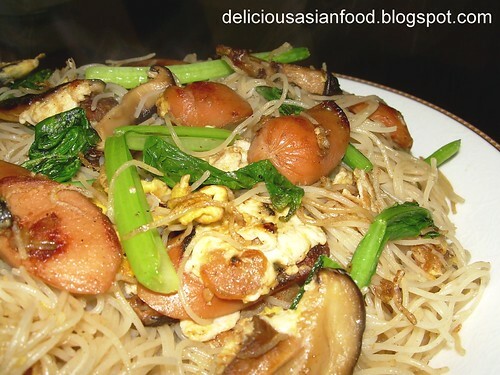 I have previously shared with you how to cook Bee Hoon with Stewed Pork Ribs. But yesterday, we have no stewed pork ribs in stock at home. What we have is chicken frankfurters. So, I decided to mix and match and am quite pleased with the outcome. Heat oil in wok. Fry the chinese mushrooms for about 30 seconds and remove from oil. Proceed to fry the dried prawns for 30 seconds. Add garlic followed by the frankfurters and eggs. Stir-fry till eggs are done and add back the chinese mushrooms. Add bee hoon and stir fry for about 3 minutes, gradually adding water which was used to soak the mushrooms and dried prawns a little at a time to keep the bee hoon moist. Add seasoning followed by chinese mustard. Continue stir-frying till chinese mustard and bee hoon is cooked. Serve with a squeeze of lime. This recipe serves 3 to 4 persons. hi, am a beginner cook, & tried this recipe today. I thought tung hoon was bee hoon, but nevertheless, it came out delicious! thanks for sharing. I tried the claypot rice in rice cooker as well the other day — my first attempt at cooking after dozens of years… my problem was estimating when the pork would be cooked! And over-estimating portions — there were only two of us, so lots of leftover! 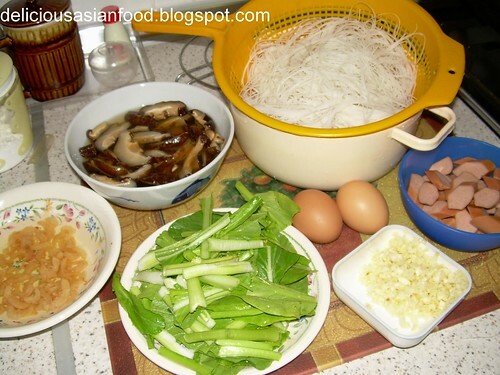 Suggest you always put down how many people the recipe serves, as you did in this bee hoon recipe. Please keep up the good work!